Just Minutes From The Twin Cities Of Copperhill, TN and McCaysville, GA. Step In Two States At One Time! A true Log Cabin, don’t wait, it will be booked. 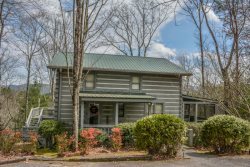 This 3BR/3BA cabin sits on 2 acres on Fightingtown Creek great for kayaking, tubing, trout fishing or just relaxing! Just minutes from town but very private, the main level of the home features 2 bedrooms and 2 bathrooms, great room, kitchen and laundry. The full, finished basement has a huge living area w/pool table, a 3rd King bedroom and full bath. The Loft of the home has a Full Sized Day Bed with a twin Trundle. Enjoy the sound of the creek while relaxing on the top deck or step out onto the lower deck to relax in the Hot Tub. Outside you’ll want to gather around one of two fire-pit’s and roast some wieners or enjoy some s’mores. An open dining pavilion with a hammock and of course the beautiful creek running behind the property for pure serenity. Walk into the main level of the home to high vaulted ceilings and a beautiful stone fireplace. The open Kitchen, Living, Dining area is the perfect place to gather. The home is beautifully furnished and the décor of cabin is the perfect mixture. You will instantly feel welcome. Located just 20 minutes from Blue Ridge and even closer to the the twin cities of McCaysville, GA and Copperhille, TN where you can stand in Georgia and Tennessee at the same time. This is a GREAT location for those who want to visit the local antique shops and events happening in the area or spend time enjoying one of the many outdoor activities. The outdoor activities are endless in the north Georgia mountains where Hiking, Kayaking, Tubing, White Water Rafting, Paddle Boarding, Horseback Riding, and Zip-lining are all right at your fingertips. You can also visit the Waterfalls, Hike to a Swinging Bridge, or take a more relaxed approach and enjoy a great meal at one of the many wonderful restaurants or breweries located nearby. Don't forget to take a ride on the Blue Ridge Scenic Railway, be entertained at the Big Foot Museum or step back in time at the local Swan Drive-in Theatre. There is something for everyone in the mountains! Easy access to cabin. Clean, easy instructions on how to do things. Secluded, just all around a great getaway. Will be coming back. Gas logs, wood for outside, pretty view!! The cabin was very clean and very well taken care of. Great job to housekeeping. Very nice and peaceful place to enjoy family time. Would recommend to others. Great place to relax.